The Braehead shopping centre is situated to the South West of Glasgow and occupies a site that has undergone serious renovation. Beautifully located, this enormous shopping centre offers a choice of shopping and leisure facilities unrivalled in the region. Just five miles from Glasgow city centre, and three miles from Glasgow International Airport, Braehead Shopping Centre is a popular place for a family day out and offers much more than just shops. 16 million customers a year pass through the facility and enjoy the best selection of shops in a single place in Scotland, plus excellent dining areas and entertainment in many forms. You can even indulge in a game of curling, or have fun on the ice skating rink. For more information visit the official website at www.braehead.co.uk. With direct transport links from Glasgow city centre by bus it makes sense to look for affordable accommodation for your Braehead Shopping Centre visit in the city itself, as you can then explore the many attractions that Glasgow has to offer. 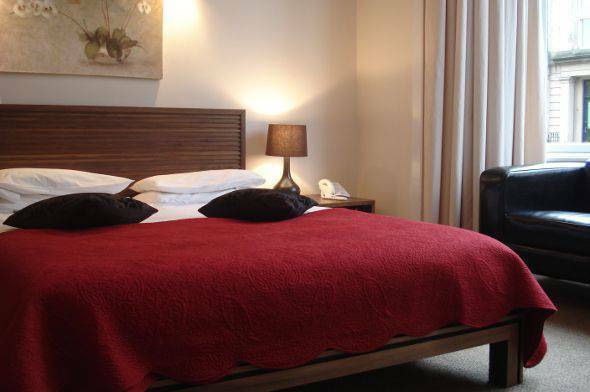 The Sandyford Hotel, perfectly located in the west end on famous Sauchiehall Street, offers superb, top quality accommodation at cheap prices. Within easy walking distance of the main attractions in Glasgow, such as the beautiful George Square and the main retail areas, the Sandyford Hotel is well placed for the direct transport links to the Braehead Shopping Centre. Bed and breakfast includes a full Scottish breakfast, the rooms are well-appointed and come with free WiFi and an en-suite bathroom, and the hotel offers a friendly and welcoming atmosphere in which to enjoy your stay. The Sandyford Hotel is a popular choice of accommodation near Braehead Shopping Centre and also allows you the opportunity to explore the many wonders that the lively and exciting city of Glasgow has to offer. It is a perfect choice for those seeking B&B in the city, so why not use the booking enquiry form at the top of the page to see if we have a room for you when you visit? You can also call us on 0141 334 0000 and we will be more than happy to help, or book online through our website.